To Cite: Mohammadierad R, Mohammad-Alizadeh-Charandabi S, Mirghafourvand M, Fazil F. Effect of Saffron with or Without Date Sugar on Intensity of Pain and Anxiety During Labor in Primiparous Females: A Randomized, Controlled Trial, Iran Red Crescent Med J. 2018 ; 20(S1):e61289. doi: 10.5812/ircmj.61289. Background: Reduction of pain and anxiety during labor is necessary to prevent some of the maternal and fetal complications, as well as request for cesarean section. There is limited evidence assessing the effects of saffron and dates on the intensity of pain and anxiety. Objectives: The current study aimed at examining the effect of saffron with or without dates on the intensity of pain and anxiety during transitional and active phases of labor in primiparous females. Methods: In the current superiority trial, 96 primiparous females admitted to a hospital covered by the Iranian social security organization in Tabriz, Iran, at the onset of the active phase of labor were recruited using convenience sampling method from 10 January to 21 October 2016. They were randomly divided into three equal groups using block randomization; receiving 80 mL oral syrup of saffron (250 mg) plus date juice (65 g), saffron (250 mg) plus artificial sugar (165 mg sodium saccharin and 420 mg sodium carboxymethyl cellulose), or placebo every two hours for maximum three doses (240 mL). The intensity of pain and anxiety were assessed using 0-10 visual analogue scale every one hour. Results: Compared with the placebo, mean scores of both pain and anxiety were lower in the intervention groups. The differences were statistically significant at the saffron plus date juice group (adjusted mean difference: -0.8 (95% confidence interval (CI): -1.5 to 0.0), P = 0.022 and -1.3 (95% CI: -2.4 to -0.2), P = 0.012, respectively), but were not significant at the saffron plus artificial sugar group (-0.5 (95% CI: -1.2 to 0.2), P = 0.322 and -1.1 (95% CI: -2.2 to 0.0), P = 0.058, respectively). The differences between the two intervention groups were not statistically significant (-0.3 (95% CI: -1.0 to 0.4), P = 0.557 and -0.2 (95% CI: -1.3 to 0.8), P = 0.927, respectively). One woman from saffron plus date juice, three from saffron plus artificial sugar, and four from the placebo groups had emergency cesarean section. Conclusions: The current study results show that the oral syrup of saffron plus date juice could be used to reduce the intensity of pain and anxiety during labor in primiparous females. However, the results are inconclusive for the effects of saffron plus artificial sugar. Childbirth is associated with one of the most severe pains experienced by females over their lifetime (1). The sympathetic nervous system responds to the pain via increasing the release of catecholamines to the blood flow, which can adversely affect the activity of uterus and utero-placental circulation, and result in maternal and fetal complications (2). Stress and anxiety are initiators of the defective cycle of pain, fear, and muscle stiffness, and can impair the muscular activity of the uterus, which results in prolonged delivery and increased rate of cesarean section (2, 3). According to a systematic review, the prevalence of cesarean delivery in Iran is estimated 48% (three times more than the global standard). Fear of prolonged delivery and pain intensity are mentioned as the main reasons for the high cesarean rate (4). Several methods are used to reduce pain and anxiety during labor (1). However, analgesics and anesthetics should not be used as the first choice for pain management, due to their potential side effects on mother and fetus (5). Saffron (Crocus sativus L.) is a plant from Iridaceae family, commonly cultivated in Iran and some other countries (6, 7). Bitter substances derived from safranal and crocin carotenoid pigment (an important component of saffron stigma) are said to have pharmacological effects (7, 8). Some studies investigated the many medicinal applications of saffron including induction of abortion (9), increasing uterine contractions (10, 11), analgesic and anti-inflammatory properties (12-14), anti-anxiety (15-17), sedation (18), and labor pain (19). Authors’ recent trial also showed that oral capsules of saffron increased the Bishop score in term pregnant females with no labor pain (20). Date or date palm (Phoenix dactylifera L.) is a fruit of Palmaceae family grown in tropical regions. It has a high nutritional value and is rich in carbohydrates such as glucose and fructose (70%), protein, B vitamins, minerals, antioxidants, and tannins (21). Some studies investigated the many medicinal applications of date palm, including anti-inflammatory and analgesic effects (22, 23), labor induction (23-26), and sedation (27). Authors found only one trial investigating the effect of the saffron capsule (17, 19) and no trial investigating the effect of date palm alone or combined with saffron on reduction of pain and anxiety during the first stage of labor. Therefore, the current study aimed at investigating the effect of oral syrup of saffron with or without date juice on the severity of labor pain and anxiety in primiparous females. The current superiority, double-blind, randomized, controlled clinical trial with three parallel arms was performed on low-risk nulliparous term pregnant females referred to 29th Bahman hospital in Tabriz, Iran, a center covered by the Iranian social security organization with about 250 vaginal births and 150 cesareans per month. The participants were females aged 18 - 35 years with a body mass index (BMI) of 19.8 - 30 kg/m2, cephalic presentation of fetus, fetal weight of 2500 - 4000 g (as estimated by the examiner or ultrasound), gestational age of 38 - 41 weeks, cervical dilation of 3 - 4 cm, with spontaneous onset of uterine contractions and reactive result in non-stress test. Exclusion criteria included multiple pregnancy; history of surgery on uterus, cervix, and birth canal; any indications for cesarean section; abnormality, growth retardation, or congenital cardiovascular defects of fetus; history of mental illness; speech, hearing, visual, and mental problems; chronic diseases such as hypertension, diabetes, respiratory, cardiovascular, liver, or endocrine problems; rupture of embryonic membrane for more than 12 hours; sensitivity to saffron; and use of any herbal medicine within 48 hours prior to enrollment. A total of 32 women were calculated for each group using G-Power software, considering mL = 73.5 and SD1 = 21 (according to pain intensity data in the study by Azhari et al. (19)), α = 0.05, power = 90%, assuming a minimum of 25% dropouts in the mean of pain intensity through intervention (m2 = 55.5), SD2 = SD1 and the possible dropouts of 10%. The primary outcomes of the current study were pain intensity and anxiety severity during the active phase of labor and the secondary outcomes included pain intensity and anxiety severity at one and 18 - 24 hours after delivery; duration of first (active phase), second, and third stages of delivery; maternal satisfaction; maternal hemoglobin, hematocrit, and platelet levels at 18 - 24 hours postpartum; and neonatal bilirubin at 18 - 24 hours after birth. Pain intensity and anxiety severity were measured with 0 - 10 visual analogue scale (VAS) at baseline, every hour during labor, and one and 18 - 24 hours after delivery. The mean scores of pain intensity and anxiety severity during labor were used in the analyses. VAS is a horizontal line of 10 cm in length, in which zero means no pain/anxiety and 10 is the highest imaginable level of pain/anxiety. The validity and reliability of this tool was confirmed in numerous studies (19). Hemoglobin, hematocrit, and platelet levels were measured at the hospital laboratory. The reliability of the test results was determined by examining 10 of the blood samples by two other laboratories which Kappa measure of agreement were higher than 0.9 in the three measures. Neonatal bilirubin was measured by transcutaneous bilirubin (TCB) skin test from the forehead and two sternum points using the Billi check, and the mean was recorded. The device was calibrated by a specialist every two weeks. The allocation sequence was generated by a person not involved in the participant recruitment and data collection, using a computer program through a block randomization with random block sizes of three, six, and nine. To conceal the allocation sequence, sequentially numbered sealed opaque pockets containing a no labeled bottle of 240-mL syrup were used. The syrups were prepared by Yashil Aras Pharmaceutical Company. Each saffron plus date sugar bottle contained 750 mg saffron and 200 g date sugar, each saffron syrup plus artificial sugar bottles contained 750 mg saffron, 0.5 g sodium saccharin, and 1.25 g sodium carboxymethyl cellulose (CMC), and each placebo bottle contained 750 mg powdered saffron essential oil, 0.5 g sodium saccharin, and 1.25 g sodium CMC. All three syrups were similar in color and odor. Therefore, participants, care providers, and the ones assessing the outcomes were blinded to the group assignment. This dose of saffron is safe. Due to a report of toxicity at five grams, the recommended doses of saffron are < 5 g/ day (7). Participant recruitment was started after the study protocol approval by the ethics committee of Tabriz University of Medical Sciences (Reference number: TBZMED.REC.1394.780) and its registration in the Iranian registry of clinical trials (Code: IRCT201507073706N26). Sample selection and allocation, data collection, interventions, and routine care for all participants were conducted by two investigators. They were experienced midwives in the hospital fully briefed about the study methods. They covered about two-thirds of all of the times (at different shifts) during the study period. During these periods, all eligible females were recruited after signing a written informed consent (convenient sampling). Baseline data were collected and the routine policy of the center including establishing an intravenous line, vital signs control, non-stress test, physician visit, and vaginal examination were performed on all participants. Then, they were randomly divided into three equal groups of saffron plus date sugar (intervention group 1), saffron plus artificial sugar (intervention group 2), or placebo. For the intervention, 80 mL of the syrup was taken orally by the women as the first dose and the dose was repeated every two hours for a maximum of three doses. It was discontinued in case of delivery, or development of any serious side effects. Every 30 minutes, a 10-minute uterine fundal palpation was conducted to evaluate severity, repetition, and duration of contractions, also fetal heart rate. Vital signs of the mothers were assessed every hour. If necessary, action was taken according to the national protocol. In the event of any dysfunctional labor (based on the program), oxytocin was injected based on the national protocol and the gynecologist order. Data were analyzed with the IBM SPSS Statistics for Windows, version 21.0 (IBM Corp., Armonk, N.Y., USA). Modified intention to treat analysis was used to compare the group outcomes, excluding the ones with cesarean section after randomization. The analysis was also performed without excluding the cesarean section cases for the primary outcomes of pain and anxiety during labor, and the results were compared with the former analysis. The normality of the quantitative data was checked through the Kolmogorov-Smirnov test. In the case of the normal distribution of the main outcomes, the groups were compared using ANCOVA adjusted for baseline values. For the multiple comparisons, Sidak correction was used. Sphericity was tested with the Mauchly test. The Shapiro-Wilk test was also used to examine the normality of residuals and the Levene test for homogeneity of variances. Participants were recruited from 10 January to 21 October 2016. Of the 32 participants in each group, one in the intervention group 1, three in intervention group 2, and four in the placebo group underwent emergency cesarean section due to fetal bradycardia, no proper progress in delivery, or no fetal head descent. Oxytocin was used in none of the cases of the intervention group 1, but in one woman in the intervention group 2 and one in the placebo group it was used for augmentation. One woman in the intervention group 1 received only one dose due to delivery in less than two hours; 16 (52%) in the intervention group 1, fifteen (52%) in the intervention group 2, and 12 (43%) in the placebo group received two doses of the syrup (Figure 1). The research groups were similar in terms of demographic characteristics and anthropometric indices. The mean age of the women was 22.2 ± 4.5 years. The majority (93%) were housewives, about half of them (48%) and more than half of their spouses (59%) had high school education; about two-thirds (67%) reported a favorable economic status (Table 1). bIntervention 1: saffron plus date sugar, intervention 2: saffron plus artificial sugar; One from Intervention 1, three from intervention 1, and four from placebo group were excluded due to emergency cesarean. c*One-way ANOVA, †Chi-square for trend, ‡The Fisher exact test, § Chi-square. In comparison with the placebo group, mean pain intensity during labor after intervention was lower in both the intervention groups. The difference was statistically significant in the intervention group 1 (adjusted mean difference: -0.8, 95% CI: -1.5 to -0.1), but insignificant in the intervention group 2 (-0.5; 95% CI: -1.2 - 0.2). There was no statistically significant difference between the two intervention groups (-0.3; 95% CI: -1.0 - 0.4). At both study time-points (i e one and 18 - 24 hours) after delivery, the median of pain intensity was significantly less in the intervention group 1 than the placebo group (P < 0.001 and P = 0.032, respectively). 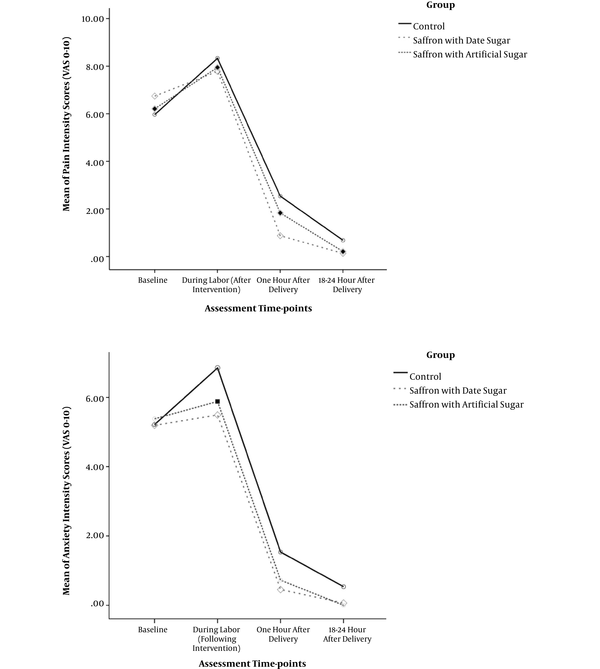 However, the difference between the intervention 2 and the placebo groups was not significant at these time-points (P = 0.090 and P = 0.053, respectively) (Table 2, Figure 2). bVAS 0 - 10: using 10 cm visual analog scale, lower score indicates better condition; intervention 1: saffron plus date sugar, intervention 2: saffron plus artificial sugar; one from intervention 1, three from intervention 1, and four from placebo group were excluded due to emergency cesarean. c‡One-way ANOVA , §ANCOVA adjusted for baseline values, ‡‡The Kruskal-Wallis test, §§ The Mann-Whitney U test. dMedian (percentiles 25 - 75). The mean anxiety severity during labor after the intervention was lower in both intervention groups than the placebo group. 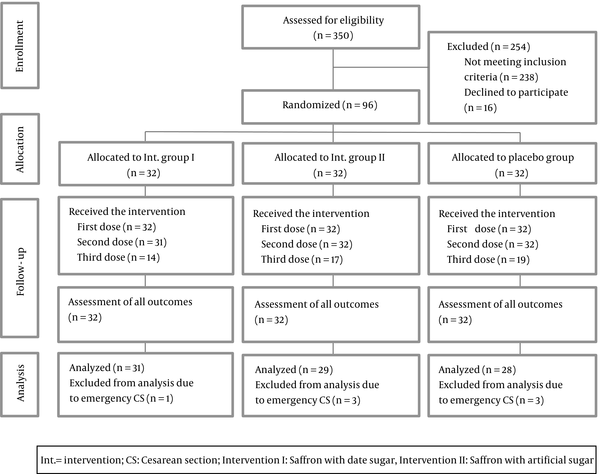 The difference was significant in the intervention group 1 (-1.3; 95% CI: -2.4 to -0.2) and insignificant in the intervention group 2 (-1.1; 95% CI: -2.2 to 0.03). There was no significant difference between the two intervention groups (-0.2; 95% CI: -1.3 to 0.8). In both time-points (i e, one and 18 - 24 hours) after delivery, median of anxiety severity was significantly higher in the placebo group than the intervention group 1 (P < 0.001 and P = 0.020, respectively) and int. group 2 (P = 0.002 and P = 0.015, respectively) (Table 2, Figure 2). The results of comparison of the groups in terms of mean pain intensity and anxiety severity during labor without excluding the women with emergency cesarean section were consistent with the results reported above (excluding the women with cesarean section). The mean duration of the active phase in the intervention group 1 was significantly shorter than those of the placebo group and intervention group 2, with no statistically significant difference between the intervention group 2 and the placebo group. There was no significant difference among the groups regarding the duration of the second and third stages of labor (Table 2). There were no significant differences among the groups in hemoglobin, hematocrit, and platelet levels. The mean neonatal bilirubin in the intervention group 1 was slightly less than those of the intervention group 2 (10.0 ± 1.3 vs. 10.6 ± 1.2 mg/dL) and the placebo group (10.0 ± 1.3 vs. 10.9 ± 1.5 mg/dL), but this difference was not statistically significant (P = 0.059). Nausea was the most common side effect in all three groups. Moderate to severe nausea was reported 16% in the intervention group 1, 17% in the intervention group 2, and 11% in the placebo group. According to our knowledge, it is the first trial investigating the effect of oral syrup of saffron plus date sugar and syrup of saffron plus artificial sugar on the severity of labor pain and anxiety. The results showed that the mean intensity of pain and anxiety during labor in both intervention groups were lower than those of the placebo group. However, the differences were statistically significant only in the group receiving saffron plus date sugar. Also, the duration of the first stage of delivery was significantly shorter in saffron plus group than the other two groups. The current study found only one clinical trial indicating that consumption of 250 mg saffron capsules every two hours for a maximum of three doses significantly reduced the intensity of the pain (19) and anxiety (17) in the active phase of the first stage of primiparous females. Some studies on laboratory mice also revealed the analgesic and anti-anxiety effect of the aqueous and alcoholic extracts of saffron and its components, safranal and crocin (14-16). The non-significant effect of the saffron plus artificial sugar on pain and anxiety intensity in the active phase of labor in the current study may be related to the low dose of saffron administered or the use of sodium saccharin and CMC along with saffron. Since severe uterine contractions during labor require a rich source of glucose, the consumption of saccharin, which is an artificial sugar, may reduce the effect of saffron compared with consumption of natural sugars. Studies on the analgesic and anti-anxiety effects of date palm on humans are very limited. A pilot study on people with chemotherapy-induced oral mucositis showed the analgesic effect of date palm pollen on pain and improvement of swallowing (28). However, there are some studies showing the analgesic and relaxing effects of relatively high doses of dates 200 - 500 mg/kg in mice (22, 27, 29). The current study suggested analgesic and anti-anxiety effect of combined date and saffron in females at labor and the first day after delivery; however, it is not possible to judge on the effect of only dates. The short duration of the active phase of labor in saffron plus date sugar group compared with those of both saffron plus artificial sugar and placebo groups may be related to the better supply of glucose needed for effective uterine contractions from high levels of carbohydrates, particularly glucose, in date palm. The severe uterine contractions during labor require a rich source of glucose. If this source is not supplied through diet, the body begins to metabolize protein and fat; otherwise, the uterine muscles develop inertia (5). These results were consistent with those of the study showing that consumption of 132 g date honey (containing 100 g carbohydrates) during labor significantly reduced the mean duration of the active phase of labor in comparison with the placebo and the routine care groups (24). No serious maternal or fetal-neonatal side events were observed in any of the treatment groups. However, given the small number of samples examined, the safety of interventions cannot be judged according to these results. Conduction of the study based on all principles of a double-blind randomized trial, appropriate random sequence generation and allocation concealment, full compliance of all the participants with the intervention protocol, low attrition (only eight cases requiring emergency cesarean section), and follow-up of all participants up to 24 hours after childbirth can be considered as the strengths of the current study, which could reduce risk of biases. Achievement of consistent results regarding the effect of the intervention on the main outcomes in data analyses through both methods of with or without exclusion of cases with cesarean section reduced the likelihood of attrition bias. In the current study, the number of emergency cesarean sections in saffron plus date sugar group (one case) was lower than that of the placebo group (four cases) and even less than that of the saffron plus artificial sugar group (three cases). This suggested that the consumption of saffron plus date sugar may reduce the rate of cesarean section. In future studies, it is proposed to assess this effect on more samples with higher doses of saffron. It is also suggested to compare the effect of saffron plus date sugar with saffron plus other sugars in subsequent studies in order to determine whether the effect on outcomes arises from special compounds of date palm or only from a high level of carbohydrates in dates. The convenient sample selection from only one center covered by the Iranian social security organization could limit external validity. Therefore, further research in other settings, especially multicenter studies, are recommended for generalizability of the results. The results show that 80 mL oral syrup of saffron (250 mg) plus date sugar (65 g), every two hours for maximum three doses (240 mL in total) could reduce the intensity of pain and anxiety during labor in primiparous females. However, the results are inconclusive about the effects of saffron plus artificial sugar. The current study was extracted from a midwifery master’s thesis. It was approved by the ethics committee of Tabriz University of Medical Sciences, Tabriz, Iran (reference number: TBZMED.REC.1394.780), and registered in the Iranian clinical trial website prior to participant recruitment (code: IRCT201507073706N26). The study was funded by research deputy of Tabriz University of Medical Sciences. The researchers would like to acknowledge their gratitude to all the mothers participating in this research, as well as Yashil Daroo Aras company for preparing the syrups. 1. Jones L, Othman M, Dowswell T, Alfirevic Z, Gates S, Newburn M, et al. Pain management for women in labour: an overview of systematic reviews. Cochrane Database Syst Rev. 2012;(3). CD009234. doi: 10.1002/14651858.CD009234.pub2. [PubMed: 22419342]. 2. Salari P, Alavian F, Habibi-Rad A, Tara F. [The Relationship between Stress, Anxiety and Pain with Salivary Cortisol Levels in First Stage of Labor in Primiparous]. Iran J Obstet Gynecol Infertil. 2013;16(55):17-21. Persian. 3. Alehagen S, Wijma B, Lundberg U, Wijma K. Fear, pain and stress hormones during childbirth. J Psychosom Obstet Gynaecol. 2005;26(3):153-65. doi: 10.1080/01443610400023072. [PubMed: 16295513]. 4. Azami-Aghdash S, Ghojazadeh M, Dehdilani N, Mohammadi M, Asl Amin Abad R. Prevalence and causes of cesarean section in Iran: Systematic review and meta-analysis. Iran J Public Health. 2014;43(5):545-55. [PubMed: 26060756]. [PubMed Central: PMC4449402]. 5. Marshall J, Raynor M. Myles Textbook for Midwives. 16th ed. London: Elsevier; 2014. 6. Srivastava R, Ahmed H, Dixit RK, Saraf SA; Dharamveer. Crocus sativus L.: A comprehensive review. Pharmacogn Rev. 2010;4(8):200-8. doi: 10.4103/0973-7847.70919. [PubMed: 22228962]. [PubMed Central: PMC3249922]. 7. World Health Organization . WHO monographs on selected medicinal plants. 3. 2007. p. 126-35. 8. Melnyk JP, Wang S, Marcone MF. Chemical and biological properties of the world's most expensive spice: Saffron. Food Res Int. 2010;43(8):1981-9. doi: 10.1016/j.foodres.2010.07.033. 9. Dashti-Rahmatabadi MH, Nahangi H, Oveisi M, Anvari M. [The effect of saffron decoction consumption on pregnant mice and their offspring]. J Shaheed Sadoughi Univ Med Sci. 2012;19(6):831-7. Persian. 10. Sadraei H. Effects of Zataria multiflora and Carum carvi essential oils and hydroalcoholic extracts of Passiflora incarnata, Berberis integerrima and Crocus sativus on rat isolated uterus contractions. Int J Aromather. 2003;13(2-3):121-7. doi: 10.1016/s0962-4562(03)00092-4. 11. Zeinali F, Anvari M, Dashti RMH, Hosseini SM. The effects of different concentrations of saffron (Crocus sativus) decoction on preterm delivery in mice. Planta Med. 2009;75(9):1026. doi: 10.1055/s-0029-1234793. 12. Poma A, Fontecchio G, Carlucci G, Chichiricco G. Anti-inflammatory properties of drugs from saffron crocus. Antiinflamm Antiallergy Agents Med Chem. 2012;11(1):37-51. doi: 10.2174/187152312803476282. [PubMed: 22934747]. 13. Tamaddonfard E, Farshid AA, Eghdami K, Samadi F, Erfanparast A. Comparison of the effects of crocin, safranal and diclofenac on local inflammation and inflammatory pain responses induced by carrageenan in rats. Pharmacol Rep. 2013;65(5):1272-80. doi: 10.1016/S1734-1140(13)71485-3. [PubMed: 24399723]. 14. Nasri S, Hosseini. S , Sahraei. H , Zardooz. H . Inhibition of pain and inflamation induced by formalin in male mice by ethanolic extract of saffron (Crocus sativus) and its constituents; crocin and safranal. Kowsar Med J. 2011;15(4):189-95. 15. Hosseinzadeh H, Noraei NB. Anxiolytic and hypnotic effect of Crocus sativus aqueous extract and its constituents, crocin and safranal, in mice. Phytother Res. 2009;23(6):768-74. doi: 10.1002/ptr.2597. [PubMed: 19142981]. 16. Pitsikas N, Boultadakis A, Georgiadou G, Tarantilis PA, Sakellaridis N. Effects of the active constituents of Crocus sativus L., crocins, in an animal model of anxiety. Phytomedicine. 2008;15(12):1135-9. doi: 10.1016/j.phymed.2008.06.005. [PubMed: 18693098]. 17. Ahmadi S, Azhari S, Jafarzadeh H, Rakhshandeh J, Mazlom R. [The effect of oral capsules of saffron on anxiety and fatigue during the first stage of labor]. J Shaheed Sadoughi Univ Med Sci. 2015;23(2):1915-26. Persian. 18. Boskabady MH, Aslani MR. Relaxant effect of Crocus sativus (saffron) on guinea-pig tracheal chains and its possible mechanisms. J Pharm Pharmacol. 2006;58(10):1385-90. doi: 10.1211/jpp.58.10.0012. [PubMed: 17034662]. 19. Azhari S, Ahmadi S, Rakhshandeh H, Jafarzadeh H, Mazlom S. [Evaluation of the effect of oral saffron capsules on pain intensity during the active phase of labor]. Iran J Obstet Gynecol Infertil. 2014;17(115):1-10. Persian. 20. Sadi R, Mohammad-Alizadeh-Charandabi S, Mirghafourvand M, Javadzadeh Y, Ahmadi-Bonabi A. Effect of Saffron (Fan Hong Hua) on the readiness of the uterine cervix in term pregnancy: A placebo-controlled randomized trial. Iran Red Crescent Med J. 2016;18(10). e27241. doi: 10.5812/ircmj.27241. [PubMed: 28180016]. [PubMed Central: PMC5285732]. 21. Al-Alawi RA, Al-Mashiqri JH, Al-Nadabi JSM, Al-Shihi BI, Baqi Y. Date Palm Tree (Phoenix dactylifera L.): Natural products and therapeutic options. Front Plant Sci. 2017;8:845. doi: 10.3389/fpls.2017.00845. [PubMed: 28588600]. [PubMed Central: PMC5440559]. 22. Umar Ibrahim M, Nordin S, Abdulkareem U, Ibrahim Haruna. S , Atif Amin. B , Thant. Z . Anti-inflammatory and analgesic activities of aqueous extract date palm (phoenix dactylifera l) fruit in rats. Int J Novel Res Healthcare Nurs. 2015;2(3):166-72. 23. Zangeneh F, Moezi L, Zargar A. [The effect of palm date, fig and olive fruits regimen on weight, pain threshold and memory in mice]. Iran J Med Aromatic Plants. 2009;25(2):149-58. Persian. 24. Kordi M, Salek-Nasiri N, Safarian M, Esmaili H, Shadjou K. [The effect of oral honey-date syrup intake during labor on labor progress of nulliparous women]. Iran J Obstet Gynecol Infertil. 2010;13(2):23-30. Persian. 25. Al-Kuran O, Al-Mehaisen L, Bawadi H, Beitawi S, Amarin Z. The effect of late pregnancy consumption of date fruit on labour and delivery. J Obstet Gynaecol. 2011;31(1):29-31. doi: 10.3109/01443615.2010.522267. [PubMed: 21280989]. 26. Razali N, Mohd Nahwari SH, Sulaiman S, Hassan J. Date fruit consumption at term: Effect on length of gestation, labour and delivery. J Obstet Gynaecol. 2017;37(5):595-600. doi: 10.1080/01443615.2017.1283304. [PubMed: 28286995]. 27. Sheikh BY, Zihad SM, Sifat N, Uddin SJ, Shilpi JA, Hamdi OA, et al. Comparative study of neuropharmacological, analgesic properties and phenolic profile of Ajwah, Safawy and Sukkari cultivars of date palm (Phoenix dactylifera). Orient Pharm Exp Med. 2016;16(3):175-83. doi: 10.1007/s13596-016-0239-5. [PubMed: 27746708]. [PubMed Central: PMC5040737]. 28. Elkerm Y, Tawashi R. Date palm pollen as a preventative intervention in radiation- and chemotherapy-induced oral mucositis: a pilot study. Integr Cancer Ther. 2014;13(6):468-72. doi: 10.1177/1534735414547110. [PubMed: 25148841]. 29. Peyghambari F, Dashti-Rahmatabadi MH, Rozabadi MD, Rozabadi RD, Rozabadi FD, Pangalizadeh M, et al. Antinociceptive effect of palm date spathe hydroalcoholic extract on acute and chronic pain in mice as compared with analgesic effect of morphine and diclofenac. Adv Biomed Res. 2015;4:244. doi: 10.4103/2277-9175.170239. [PubMed: 26693469]. [PubMed Central: PMC4685642].